First things first; go and grab yourself a warm drink, some munchies and get comfortable because this blog is going to be a little long. I will be completely honest, I hate winter. I hate the cold, the rainy, and the dullness - it makes me feel miserable. 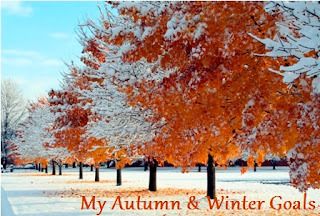 But things are different this year, I'm not sure why honestly but I am actually excited for the autumn and winter time; cosy booties, jumpers and cardigans, warm drinks, candles, home cooking, movie nights, crisp air, Halloween and Christmas. Plus this year on 12th December is going to be Phil and my first year wedding anniversary and it will be so nice to just relax and not have the stress building up that we have had over the past two years. Print out pictures and put in frames: This is something I've been wanting to do for ages and just haven't gotten around to doing so. We have so many picture frames around our home that need pictures going in its silly. 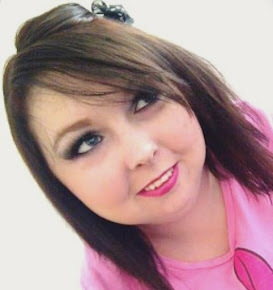 Share more make up looks online: I do my make up all the time and never end up taking pictures to put up online, which is terrible as I'm a make up artist and beauty blogger. I know a lot of you keep asking me to take more face of the day posts so I am going to try and remember to do so. Be involved in more twitter chats: Although I do get involved as much as possible in the tumblr chats, I am always so busy that I do miss a lot of the chats that do go on twitter. I always make sure that I reply to everyone but actually being involved in the chat is hard sometimes. Read at least three books: I have so many books piling up that I want to read that I never seem to have time to do so, but it's going to be autumn and winter time and my plan is instead of always listening to music when in the car, taking one of my books and reading some of that instead. Visit Blackpool Lights: I haven't been to see Blackpool lights in years and I really want to go this year. My mum and me have been talking about going on a family day out to Blackpool to see the lights for a while so I'm hoping that we can all go as a family sometime soon, as it's really hard to get together sometimes because of everyone's work schedule. Visit Croxteth Park at winter time: Croxteth Park is such a beautiful place in the summer time, I would love to see what it looks like in the autumn time with all the leafs changing colour and the winter time in the frost and snow. I done a review of "Out Day Out at Croxteth Hall, Farm & Park". Watch the sun set over the River Mersey in Liverpool: I have been wanting to do this for so long, and I would really love to do this all snuggled up with Phil in my new coat and my new scarf, my boots, a ho drink, I basically think it would just be wonderful and romantic. Bake more: I have so many things I want to bake, and baking really makes me feel lovely. I usually bake coffee cup cakes for my Nan as she loves them, and lemon cake for my dad who loves lemon cake. I'm not the best with decorating and icing cakes (probably because I don't eat icing so don't care for it much) but I love baking them. Cook meal for entire family: I haven't had a meal with my entire family since last year which was when we had our pre-wedding meal with the family, so I really want to make some time to do that with my husband, brother, parents, grandparents, Phil's mother and Phil's brother too. If you are doing an autumn or winter goals blog post let me know and send me links so I can read them all as I love them! Or if you have ever been to any of the places I am planning to go to this summer again let me know as it would be cool to share stories and maybe we are even going on the same day - how cool would that be?! I hope you all enjoyed this more personal side to me in this blog, and I hope you all have a wonderful day.